Staff file photo by Erin O. Smith / Bernie Kuhajda, a biologist with the Tennessee Aquarium, talks about the fish and other life seen in the water Thursday, July 19, 2018 at the Conasauga Snorkeling hole in Polk County, Tennessee. Seventy-six species of fish live in the Conasauga River. That's more than the Colorado River and Columbia River watersheds — which make up much of the Western United States — combined, despite being less than 1 percent the size. It's one of the most biodiverse rivers in the temperate world and flows through East Tennessee. The river is less than 100 miles long, but there are dozens of salamanders, mussels, snails, crayfish and other invertebrate species beneath the surface. It's also home to three federally threatened or endangered fish, six threatened or endangered mussels and 16 state-listed species. The river, which runs through Southeast Tennessee and Northwest Georgia, is one of several in the Southeast with biodiversity rivaled only in the tropics. Despite its aquatic biodiversity, the Southeast receives a small fraction of the federal funding allotted to such species nationwide. About 30 percent of the threatened and endangered fish in the U.S. are located in the Southeast. However, the region receives just 0.9 percent of the federal and state funds given to threatened and endangered fish. One individual fish in the Pacific Northwest received the amount of funding in one year that all threatened and endangered fish in the Southeast receive in 37 years. Data show the Southeast is in a class of its own when it comes to freshwater biodiversity in temperate climates. The Southeast's Tennessee, Cumberland and Mobile river basins have 48 percent of the fish species in the U.S. and Canada, but make up 1.4 percent of the area. When including the rest of the Southeast, that number balloons to nearly 80 percent — 550 of the 831 freshwater fish in the U.S. and Canada. About one-third of the world's crayfish species and 40 percent of the world's freshwater mussel species — including 91 percent of U.S. mussel species — can be found in the Southeast. All that is to say the Southeast is North America's most biodiverse region. There isn't a close second. "We're in the temperate rainforest of the world as far as freshwater; there's nowhere else in the world like this," Knoxville-based Conservation Fisheries Inc. co-director J.R. Shute said. Southeastern biologists say they need more money to protect the trove of rare species in the region. They need money to expand their facilities, to better accommodate more species, to help farmers pay for better agricultural practices such as installing retention ponds, and to improve habitat for species in their natural environment. However, the federal funding for this temperate rainforest is far exceeded by the rest of the U.S. The three threatened and endangered fish in the Conasauga — the Conasauga logperch, the amber darter and the blue shiner — each received about $41,000 in federal funding annually between fiscal years 2012-2016. Others in the region received far less. For example, Alabama's cahaba shiner received about $1,400 annually during the same time period. Meanwhile, species in the West can receive well north of $1 million annually. Federal funding for threatened and endangered species is public information. Each dollar spent for research and protection is available for those willing to look. However, there's no easy way to compare annual funding for all species sorted by regions. The existence of a funding disparity has been widely known by regional scientists but hardly understood or backed with hard data. Such information would require years of record keeping: tracking individual species, knowing where each is located and then logging funding data year after year after year. Kuhajda is an aquatic conservation biologist and the science program manager at the Tennessee Aquarium Conservation Institute. "I wanted hard numbers; real hard numbers to empower the federal agencies to get more funding to the Southeast," he said. "And to be able to relate to the general public how little of their tax dollars go to protecting aquatic animals in their backyard." Kuhajda used a spreadsheet to track what was spent on freshwater species with ranges entirely in the Southeast and compared those numbers to what was spent on freshwater aquatic species found entirely outside the region for every fiscal year between 2012 and 2016. Mussel species outside the Southeast have 2.1 times more funding per species than mussel species found only within the region, according to Kuhajda's research. Freshwater crustaceans have seven times more funding per species outside the Southeast. Fish are where he found the biggest difference. Fish outside the Southeast receive 46.6 times more funding per species. "I would never guess there was almost $50 spent on fish outside the Southeast for every dollar spent here," he said. "I didn't know it was that bad. I wouldn't have known that. Now I have these facts, and I think they're really powerful." This isn't a new issue for aquatic biologists and conservationists. They have long understood the Southeast doesn't get its fair share of federal money. They openly discuss it, but some accepted it as a fact of life long ago. "We've been aware of it even before Bernie started tracking this," Conservation Fisheries Inc. co-director Patrick Rakes said. "Us trying to find money to do what we want to do is a constant tooth-pulling battle to get money from the government." But those conversations in labs across Tennessee, Georgia, Alabama and the rest of the Southeast haven't widely reached the public consciousness. Kuhajda's goal is to use the data to help the public better understand the problem. Then they can go to politicians to ask for more funding. It's the second step of a years-long effort by aquarium personnel to educate the public on freshwater species. 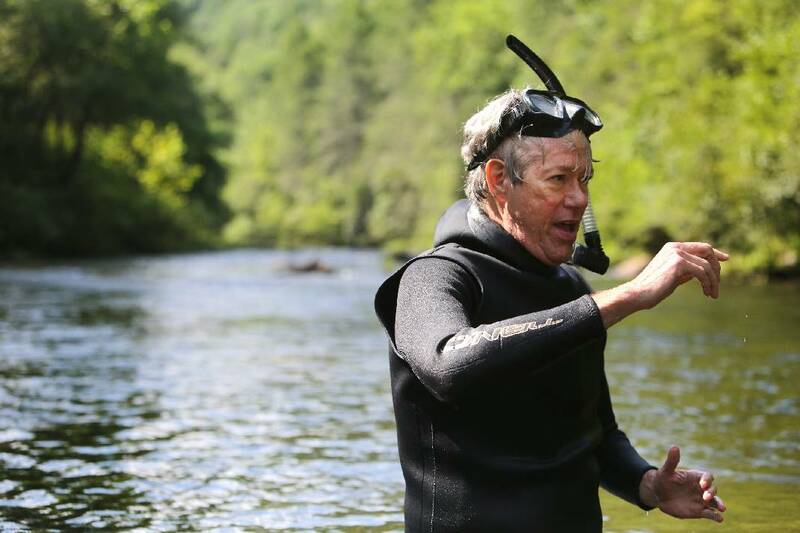 For more than a decade, they've been teaching millions of people about the aquatic biodiversity found in the Southeast. Now, they're hoping those same people will help in the aquarium's effort to protect the freshwater ecosystem. Much of the federal funding for threatened and endangered species in the Southeast comes one way or another from the Fish and Wildlife Service. Service officials were unable to comment on non-shutdown-related inquiries during the prolonged government shutdown, but a funding disparity is something they're aware of, according to an agency official. There's a litany of potential explanations for the disparity: federal versus private land, cultural differences, different tax bases, etc. Much of the land west of the Mississippi is federally owned. There are fewer private landowners, less development, more empty space and fewer regulatory hoops for the federal government to jump through to fund conservation efforts on land it already owns. In general, it's much easier for the federal government to commit to conservation on land it owns, according to one federal employee. Both the Southwest and Pacific Northwest get an exorbitant amount of funding for that reason, among others, experts say. Kuhajda believes there are fundamental differences in how Southeastern residents view using taxes to fund conservation compared to the western U.S.
"My guess is the constituents in the Pacific Northwest are vocal about protecting aquatic resources. I don't think we have that voice for the politicians to listen to in the Southeast," he said. "Part of our mission [at the aquarium] is to educate people about the great aquatic forests we have here. If people knew what we had, they'd be more interested, proud of it and would have their politicians fight for it." However, there is pressure on elected officials to protect natural habitat in the Southeast, according to Congressman Chuck Fleischmann, R-Tenn., but much of that focus is on preserving state and national parks. When he does hear about such issues, it's often in favor of protecting larger species in the public eye, such as birds, game animals and wolves. "I think citizens of Tennessee are as committed as any of the citizens in any of the states to preserving our endangered species, to protecting the environment and to conservation," he said. "I do think there is a decidedly different approach in how to do that." He went on to say he hears regularly from sportsmen in favor of conservation and land trust issues, but Tennesseans often would rather see private groups do that than the federal government. Much of the funding in the Southeast does ultimately go to game species that are fished and hunted, and there are reasons for that. Most of the funding in Tennessee comes from hunters and fisherman, so that's what receives priority. "Hunters and fishermen have paid for conservation in this country forever," said Tim Churchill, chief of the Tennessee Wildlife Resources Agency's federal aid and real estate division. "There's no system for passive users to pay for the system." There's not much freshwater conservation funding from the Tennessee's general fund, said Churchill, who is a fisheries biologist by training. Tennessee has no income tax, so agencies tend to be more frugal about such spending. Federal money often requires matching funds from the state, which Tennessee has been reluctant to do. "As far as not getting funding, that's the truth," Churchill said. "Compared to what we get from game animals, it's a pittance." Churchill isn't arguing the state should take its priority off game animals, but he would like to see more funding used for other conservation efforts. "It's just a shame. All these years, this has been percolating for 25 years, to try to get funding and have an understanding that these species are part of the same ecosystem," he said. "Funding one or the other helps both. Being able to specifically address things for non-game animals is good for the whole ecosystem. It keeps things off the [threatened and endangered] list." TWRA representatives are pushing heavily for the Recovering America's Wildlife Act. "If that ever got funding, it'd be fantastic. It'd be a huge, huge increase," Churchill said. "That would change a lot of things. It would change the culture of TWRA, I think." The legislation recommends Congress authorize $1.3 billion annually from energy development on federal lands and waters to the existing Wildlife Conservation Restoration Program. Tennessee would get an additional $20.8 million annually. The legislation was proposed by leaders of the energy, outdoor recreation retail, manufacturing and automotive sectors as well as sportsmen and women and other conservation groups. It would not require a tax increase. Congress asked states to develop wildlife action plans to outline conservation actions necessary to sustain the health of their state's fish and wildlife. The act would help states implement those plans. "The answer to everyone's needs for non-game wildlife funding will be the passage of the Recovering America's Wildlife Act," according to an email from Pandy Upchurch, assistant chief for the TWRA Biodiversity Division. " If passed by Congress as written, it would still require a 25 percent match. That is still limiting, but at this point in time, passage of this bill is where I think everyone's energies should be focused." The bill stalled in Congress before a vote. It is expected to be reintroduced.